As we start thinking ahead to the TESS mission (Transiting Exoplanet Survey Satellite), currently scheduled for launch in 2017, the exoplanet focus sharpens on stars closer to home. The Kepler mission was designed to look at a whole field of stars, 156,000 of them extending over portions of the constellations Cygnus, Lyra and Draco. Most of the Kepler stars are from 600 to 3000 light years away. In fact, fewer than one percent of these stars are closer than 600 light years, while stars beyond 3000 light years are too faint for effective transit signatures. Kepler has proven enormously useful in helping us develop statistical models on how common planets are, with the ultimate goal, still quite a way off, of calculating the value of ηEarth (Eta_Earth) — the fraction of stars orbited by planets like our own. Looking closer to home will be the mandate of TESS, which will be performing an all-sky survey rather than the ‘long stare’ Kepler has used so effectively. We should wind up with a growing catalog of nearby main-sequence stars hosting planets, a catalog that future missions will exploit. But what of Kepler itself? It’s heartening to see a mission rescued when onboard problems have threatened its survival, and in the case of this doughty space telescope, the revival is almost as interesting as the latest results. The Kepler primary mission ended with the failure of the second of four reaction wheels that were used to stabilize the spacecraft. Kepler needed three reaction wheels for effective pointing accuracy, but ground controllers found a way to use the pressure of sunlight as a kind of ‘virtual’ reaction wheel to control the instrument. Thus we get K2, the extended Kepler mission. Software to correct for drift in the field of view allows the telescope to achieve about half the photometric precision of the original Kepler mission, according to this University of Hawaii news release. A new exoplanet find — HIP 116454 b — demonstrates that the method works and that Kepler is, at least to some extent, back in business. Unlike most of the stars in the original Kepler field of view, HIP 116454 is relatively nearby, at 180 light years from Earth in the constellation Pisces. 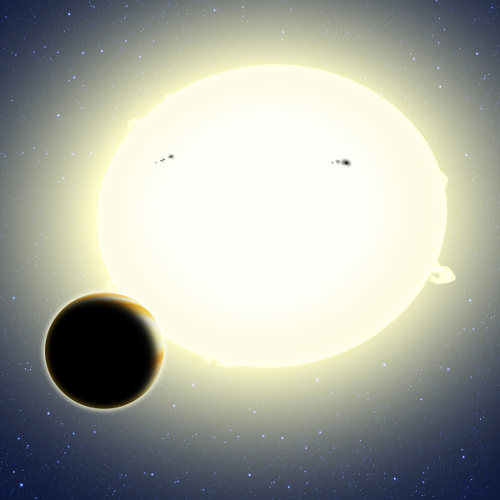 Image: This artist’s conception portrays the first planet discovered by the Kepler spacecraft during its K2 mission. A transit of the planet was teased out of K2’s noisier data using ingenious computer algorithms developed by a researcher at the Harvard-Smithsonian Center for Astrophysics (CfA). The newfound planet, HIP 116454 b, has a diameter of 32,000 kilometers. It orbits its star once every 9.1 days. Credit: CfA. Working with K2 is exceedingly tricky business, with NASA likening the use of solar photons to stabilize the instrument to the act of balancing a pencil on a finger, a manageable but demanding task. Nor was HIP 116454 b an easy catch. For one thing, only a single transit was detected in the engineering data that was being used to prepare the spacecraft for the full K2 mission. That called for confirmation from ground-based observatories, which came from the Robo-AO instrument mounted on the Palomar 1.5-meter telescope and additional follow-up from the Keck II adaptive optics system on Mauna Kea. HIP 116454 b could be important in the era of the James Webb Space Telescope (JWST) to probe the transition between ice giants and rocky planets. In the Solar system, there are no planets with radii between 1–3 R⊕ while population studies with Kepler data have shown these planets to be nearly ubiquitous… Atmospheric studies with transit transmission spectroscopy can help determine whether these planets are in fact solid or have a gaseous envelope, and give a better understanding on how these planets form and why they are so common in the Galaxy. Also of interest is the fact that HIP 116454 b is very similar to HD 97658 b, in terms of its orbital characteristics (both are in ∼ 10 day low-eccentricity orbits), mass and radius (within 10% in radius, and within 25% in mass), and stellar hosts (both orbit K–dwarfs). Comparative studies of these two super–Earths will be valuable for understanding the diversity and possible origins of close–in Super–Earths around Sun–like stars. We know from this work that K2 can find transiting planets despite the loss of precision the telescope has suffered, and the paper points out that the engineering test field in which HIP 116454 b was found as well as other potential fields of view will enable observatories in both hemispheres to view the stars for follow-up, something that was not possible in the original Kepler mission. So with K2 capability, we can see HIP 116454 b, relatively nearby, as a kind of bridge between the original Kepler statistical studies and the nearby targets of the TESS mission to follow. The paper is Vanderburg et al., “Characterizing K2 Planet Discoveries: A super-Earth transiting the bright K-dwarf HIP 116454,” accepted for publication in The Astrophysical Journal (preprint). I was overjoyed to hear about the revival plans and am amazed that the K2 mission is well underway. I can’t help but wonder… can this system of using solar light-pressure as a virtual gyro help us learn how to attitude-control any future light/mag sails? (a perfect case of ‘on-the-job-training’). Or is this special case too disimilar to benefit much from? Either way, it’s good to have Kepler back with us again. So the raw data was for just one transit. Follow up observations from the ground were used to confirm the planet. Does this mean that we could apply the same sort of analysis to the original Kepler data to find candidates with larger orbits, or does this work only for closer stars with close orbiting planets? They did say they would accept two rather than the usual three transits for proof of existence given the targets were nearer in this viewing field and as a result in reach of Doppler confirmation . We should probably all accept a higher false positive rate from the great enemy of transit astronomy , the contact binary. Better once uber sensitive ESPRESSO spectrograph up and running in 18 months . The “two transit” confirmation also allows for longer orbital periods for discovered planets to partially compensate for the shorter 75 day maximum “stare” at the field of view. So some might just be in the HBZ of smaller stars and the sample will be more representative of the planetary population as Jim says, rather than all being deep transit “roasters”. Be interesting when we see the first Gaia astrometry planets. Promised for so long , hopefully this method will finally come good and we will be inundated with exoplanets over the next ten years. If TESS can last just over 5 years it will roll nicely into WFIRST ( which got a Mission scientist today-good sign) and PLATO. this is why i’m interested in astronomy (& other science): with all the things going on in our world, the ingenuity of scientists in delivering this kind of unambiguous advance is necessary for all our spirits. pixel-images of near earth-size planets?! Using data from a smaller number of transits is only possible for planets sufficiently near to have their existence confirmed by the alternative RV spectroscopy method. The K2 field is relatively nearby stars .This was the big issue with the original Kepler target stars which were much further away than this in the current fields of view so could only be confirmed by transit photometry thus the more stringent three confirmed transits for proof of existence. It also meant their masses couldn’t be constrained and consequently their bulk densities too. The draw back is that the telescope has to be realigned every 75 days to avoid sun damage so the maximum number of transits in that time is two, with a consequent orbital period of 37.5 days , ruling out habitable zone planets for all but late M dwarf stars( M3 and above). This led the thinking behind the TESS targets ,all of which will be near enough to be confirmed by RV and thus will also only require two transits , possibly even one for very “deep” transit signals . They know the discovery will be followed up so can accept the risk of a false positive. On January 4 in Seattle, Washington, Gaudi will take a tentative first step towards corralling this rowdy bunch. As chair of NASA’s Exoplanet Exploration Program Analysis Group, he will try to nudge a roomful of US exoplanet scientists into generating a coherent, specific vision for where the field should go. A recent Search for Extraterrestrial Intelligence (SETI) effort studied 86 candidates in the Kepler space observatory’s field for radio signals that could potentially indicate the presence of an intelligent civilization. I know I should be grateful that SETI is being conducted at all, but so long as we keep doing only the method and targets that Frank Drake started with in 1960 we will be waiting a very long time for a signal. I have said before that many SETI projects are token efforts and this seems just like another one. Does anyone know if the ATA is back to doing real SETI or not? The fact that I have to ask and have not seen any recent news about them, especially as I look for such news items, says a lot. Kepler’s ultra-precise, long-duration photometry is ideal for detecting systems with multiple transiting planets. These systems provide important data for understanding the dynamics, formation, and evolution of planetary systems. The fascinating YouTube video below presents a detailed analysis of an extremely compact and old five-planet system around a seismic K dwarf (KOI-3158, HIP 94931). KOI-3158 is a bright, high-proper motion, main-sequence star of spectral type K0. Its overabundance of alpha elements and peculiar kinematics make it a member of the Galactic thick disk. Interestingly enough, it belongs to the Arcturus stellar stream, a moving group originally thought to be of extragalactic origin, but nowadays interpreted as arising from dynamical perturbations within the Galaxy. SETI has pointed a powerful radio telescope array at the Kepler Space Telescope’s most recent exoplanetary discovery in the hope of detecting an artificially-generated radio signal. Alas, the world is not transmitting, and probably isn’t home to an extraterrestrial intelligence. SETI, which stands for the Search for Extraterrestrial Intelligence, utilized the Allen Telescope Array (ATA), located in at Hat Creek Radio Observatory, 290 miles northeast of San Francisco, Calif., to study HIP 116454b, an exoplanet 180 light-years away in the constellation Pisces. The exoplanet, that measures 2.5 times the diameter of Earth (and is therefore defined as a ‘super-Earth’), was the first discovery made by Kepler in its rebooted “K2” mission. The data recently accumulated by the Kepler mission have demonstrated that small planets are quite common and that a significant fraction of all stars may have an Earth-like planet within their Habitable Zone. These results are combined with a Drake-equation formalism to derive the space density of biotic planets as a function of the relatively modest uncertainty in the astronomical data and of the (yet unknown) probability for the evolution of biotic life, Fb. I suggest that Fb may be estimated by future spectral observations of exoplanet biomarkers. If Fb is in the range 0.001 — 1 then a biotic planet may be expected within 10 — 100 light years from Earth. Extending the biotic results to advanced life I derive expressions for the distance to putative civilizations in terms of two additional Drake parameters – the probability for evolution of a civilization, Fc, and its average longevity. For instance, assuming optimistic probability values (Fb Fc 1) and a broadcasting longevity of a few thousand years, the likely distance to the nearest civilizations detectable by SETI is of the order of a few thousand light years. The probability of detecting intelligent signals with present and future radio telescopes is calculated as a function of the Drake parameters. Finally, I describe how the detection of intelligent signals would constrain the Drake parameters.